Looks great, well built, very compact. May need to consult the manual occasionally when using the auto functions - asides from that it works well. Bosch have a reputation for creating well built appliances, and the HMT75M451B microwave is no exception, providing 17 litres of space, and a powerful 800w output. The Bosch HMT75M451B offers exactly the same specification as the HMT75M461B model, but is finished in stainless steel silver instead of black. It doesn't feature a grill or oven facility, but it does provide auto defrost, auto weight cook, 5 different power levels, as well as a 24.5cm turntable which should accommodate most dinner plates. The timer system goes up to 60 minutes, and together with the power level and clock is displayed on a digital LED display. The overall build quality feels pretty good - one of our testers owns this model, and it has worked perfectly for the last two years. Given the capacity, it is a pretty compact microwave, with exterior dimensions of 46.2cm by 32cm by 28cm, and overall weight of 15kg. The only minor fault we can find with this model is when using the automatic defrost setting you may have to check the manual to find out which number corresponds to which food stuff. If you're looking for a large microwave, then this is probably not the model for you. However if you're looking for a small, easy to use, well built silver microwave oven, then we'd highly recommend this model. 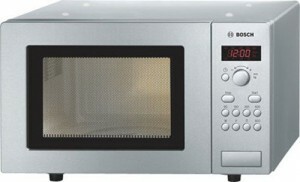 If you after a small and reliable microwave, then the Bosch HMT75M451B comes recommended.